This page is a prime example of what made the two-parter in Dark Horse Comics #14 & 15 so difficult; every panel is an establishing shot. I really had to work it to get the drama and variation of panels 4 and 5. In a way, I was really constrained by the necessary tightness and denseness of Mike Barr’s script. My job, in these first 2 installments, was to recapitulate the entirety of volume 1, while setting up the forthcoming mini-series. I had very little room to maneuver, to strut my story-telling stuff. During this period, my primary influences were Alex Toth, Jack Kirby, Alfred Hitchcock and Hayao Miyazaki. I could bring none of these to bear as I struggled through the initial stages of “The Mark” revamp. It was causing me major angst; my heroes would not have tolerated being so artistically constrained. But I was just starting my career and couldn’t afford to cop un-earned attitude. Ah, youth…. 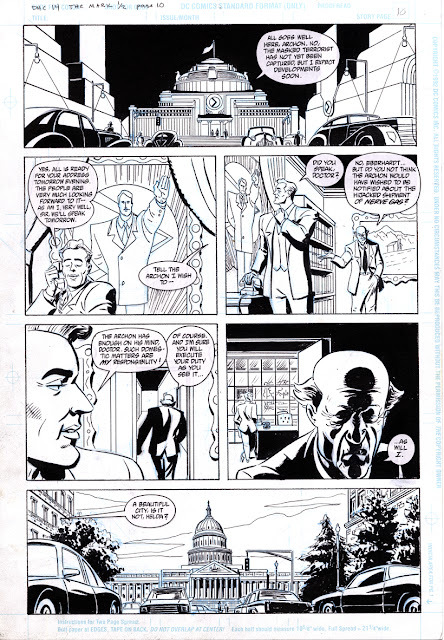 This is page #10 from Dark Horse Comics #14, “The Mark: Taking Back the Streets”, written by Mike Barr, drawn by Brad Rader, published in November, 1993.